I sailed the western Caribbean on the Carnival Liberty not long after the first of the 2.0 changes were made to the ship, and I'm happy to say that the cruise line has some winning ideas. 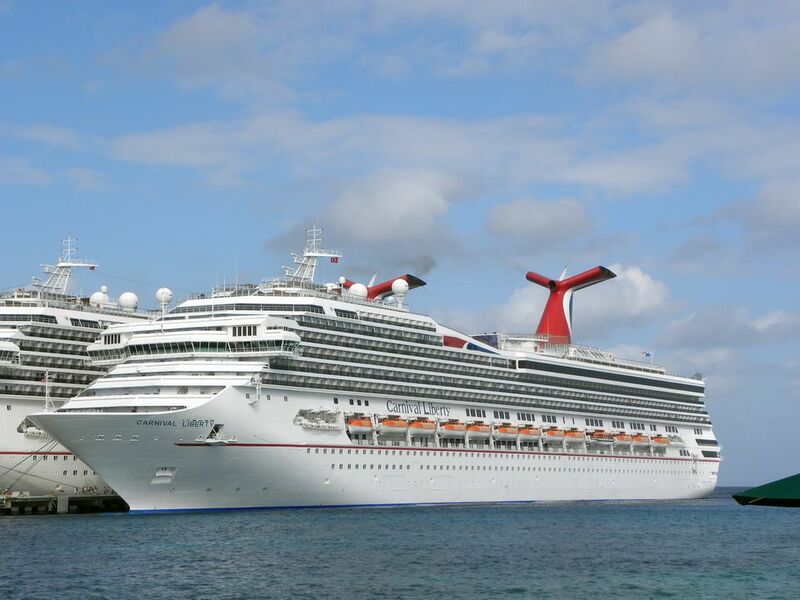 The Carnival Liberty was the first of the Carnival Cruise Lines ships to undergo its FunShip 2.0 renovation. Carnival announced in 2011 that the company is investing over $500 million to enhance its fleet over the next several years. I had previously sailed on the Carnival Liberty in 2006, so it was interesting to see the changes made to the ship. First, Carnival has partnered with some big names to bring new entertainment and dining options to the ships. Comedian George Lopez consulted on the hiring of comedic talent, and Food Network television star Guy Fieri introduced a new free outdoor grill on the ships called Guy's Burger Joint. Video game fans will recognize the name EA Sports. Carnival has worked with this company to develop a new sports bar concept, aptly named the ​EA Sports Bar. This bar is next to the casino where the former sports bar, Gloves, was located. This new bar has a whole wall of flat screen monitors for watching sports action, playing trivia games, or competing in video games. Finally, under license from Hasbro, Inc., Carnival will create Hasbro, The Game Show, a new series of entertainment activities based on the popular Family Game Night television show from The Hub. In addition to the big-name consultants, Carnival added two new outdoor bars to the Carnival Liberty. These fun spots are located next to the Lido deck pool. The RedFrog Rum Bar is a poolside version of the RedFrog Pub on the Carnival Magic. Rum may be a popular Caribbean libation, but tequila is also a favorite. So, Carnival has also added the BlueIguana Tequila bar on the Carnival Liberty on the opposite side of the pool. I love Mexican food, so was delighted to see the new BlueIguana Cantina. This complimentary poolside dining destination offers freshly made burritos and tacos on homemade tortillas, along with a nice salsa bar with a variety of toppings. Overall, I loved the enhancements made to the Carnival Liberty, and I think my fellow cruisers on our western Caribbean cruise did too. The new bars were packed with patrons, and the new dining venues were terrific. Although some of the entertainment changes will evolve over the next few months and years, the plans are intriguing and the future looks FUN for those who sail with Carnival. Let's take a tour of the Carnival Liberty. We were in Carnival Liberty balcony cabin #8389 and were well pleased with this cabin. The balcony was large enough for two chairs and a small table. The cabin was quiet, and we had plenty of storage space. The cabin was made up with a queen-sized bed, which could be separated into twin beds. The stateroom also had a nice sofa, cocktail table, storage shelves, flat-screen television, and dressing table. The television had several news and movie channels. The closets were large enough for two people, although the hangar configuration was inconvenient since you couldn't take the hangers out of the closet. I guess some people must steal hangars from cruise ships just like they do from hotels or otherwise the cruise line would make the hangars easier to use. The cabin was quite comfortable and had good lighting. The dressing table only had one plug-in, but I had brought along a power strip to hook up all my electrical equipment (camera, computer, phone, etc. ), so we were fine. The bathroom had a shower with a curtain. The sink area had shelves for all our toiletries, and a makeup/shaving mirror, which I always like to see in a cruise ship cabin. The bathroom came equipped with all sorts of small packages of sample items, and the shower had a container of shower gel and shampoo. I had to use my own shower cap, so was glad I brought one along. The Carnival Liberty has 20 different price categories among the seven different types of cabins, ranging from inside cabins to luxurious suites. Over 500 cabins are balconied such as ours was. Overall, I thought the Carnival Liberty dining options and food quality were very good on our western Caribbean cruise. Just imagine serving 3,000 hungry people 24 hours per day! Since we were usually anxious to get ashore and go exploring, we ate breakfast in the buffet-style Emile's Bistro. It had all the standard fare, including an omelet station. Although most of the other passengers also ate in Emile's for breakfast, the buffet lines were manageable; we never had to wait too long. The Carnival Liberty had many options for lunch, and we tried them all. One of the main dining rooms was open for lunch on sea days, but most passengers enjoyed a casual lunch either by the pool or in the food court area at Emile's on the Lido Deck. Emile's had a buffet lunch with many diverse options, and the deli, pizza bar, and Mongolian Wok are nearby. The Mongolian Wok is a favorite of many cruisers (like me), but the lines often are long. The wait is worth it, but you might want to try it the first day or on a port day, when not as many people are on the ship. The BlueIguana Cantina has excellent burritos and tacos, with a great self-serve salsa bar. My husband loved the fried oysters and seafood soups at the Fish & Chips bar on deck 10 upstairs from Emile's. My favorite casual lunch spot was Guy's Burger Joint, where you'll find the best burgers at sea. There was certainly something for everyone! Dinner was our favorite meal. We ate in the Silver Olympian Dining Room, but had dined in the "anytime dining" Golden Olympian Dining Room on a previous cruise of the Mediterranean on the Carnival Liberty. Both are excellent and lovely dining venues. The food was delicious, and the portion sizes just right. Our waiters remembered our names and usual requests (white wine, decaf coffee, etc.) from the first night. They anticipated our needs and were exceptional. We ate at Harry's Steakhouse ($30 per person cover charge) one night. The presentation and taste of the food was marvelous, and the cover charge hasn't changed since 2006 when I dined there before. One word of caution--the portion sizes are larger than those in the main dining rooms, and you will need to allow at least two hours for dinner. Was it worth the $30 extra? We all agreed it was, but others might not. The Jardin Cafe and Origami Sushi Bar are along the Promenade aft on deck 5. The Jardin Cafe is a patisserie that serves delicious snacks and specialty coffees for an extra fee. Origami features fresh complimentary sushi rolls most evenings between 5 and 8:15 pm. Since we had dinner at 8:15 each night, Origami was a good place to have a snack before getting cleaned up for the evening. We did not try the Chef's Table since the reservations are limited, but it sounds like a very special experience. Up to 12 guests enjoy wine and hors d'ouevres in the galley with the ship's chef de cuisine. The group then get a personalized tour of the galley with the chef and get to see the galley in action, something usually missed on regular galley tours. The evening concludes with a memorable dinner with appetizers, entrees, and desserts designed by Carnival's master chefs specifically for the Chef's Table dinner. The Chef's Table is $75 per person and can be booked at the Guest Services Desk. Doesn't the evening sound marvelous? Room service is available 24 hours per day on the Carnival Liberty at no extra charge. Since breakfast is the most popular room service meal, it's a good idea to use the card provided in the cabin to order the night before. You can't order off the regular dining room menu as you can on small luxury ships, but the room service menu has a nice selection of items that will carry you over until the next meal. The interiors of the Carnival Liberty are mostly bright, contributing to the overall fun environment. The soaring atrium is filled with flowers (artificial) and a huge chandelier with lights of changing colors. It's very festive and a great atmosphere for cruising the Caribbean! The Carnival Liberty has many lounges spread throughout the ship. The Venetian Palace is the large show lounge, with good seating spread over three decks. The Venetian theme is carried over to the two jesters on either side of the stage and the cute tables shaped like Carnival masks. This show lounge is used for evening entertainment and popular activities like bingo. The Victoria Lounge is the second largest lounge and is like a cabaret, with comedy shows and live music karaoke. Next to the Victoria Lounge is The Stage, which was used as a venue for live Latin music on our cruise. Downstairs from these two venues is The Cabinet, which has nice seating, a dance floor, and is used for karaoke, magic shows, and various other entertainment. The Hot & Cool nightclub and disco is a busy place in the late evening. The smaller indoor bars feature all sorts of fun themes. The lively Piano Bar has sing-a-longs around its huge "piano". Those looking for a quiet bar will enjoy the Alchemy Bar with its fascinating assortment of premium drinks. The EA Sports Bar (previously called "Gloves") has sixteen 46-inch flat screens, perfect for watching sports or playing video games. We liked sitting in either the Promenade or Flower Lobby bars in the evening because the people-watching was so much fun! The Carnival Liberty has a nice Internet lounge tucked away behind The Cabinet on deck 4. The ship has WiFi available shipwide (for a fee), and many people either used their own laptops or tablets to access the Internet. Like most large ships, the Carnival Liberty has a large casino and shopping arcade, both on the popular Promenade Deck. The ship also has conference rooms, a lovely small library that seems to only be open an hour or so a day, and a card room. Kids sailing on the Carnival Liberty have their own age-appropriate areas. The Club O2 age group (ages 15-17) have the exclusive use of a lounge on the deck 5 Promenade. It features bar stools shaped like Duracell batteries. This lounge is conveniently located next to the video arcade. The Circle C age group (12-14) also have their own lounge on deck 4. I'm sure the older teens are glad these two lounges aren't TOO close! The younger kids' Camp Carnival is indoors forward on deck 12 near the adults-only Serenity outdoor deck area. It's really fun to just take a deck plan of the Carnival Liberty (obtained at embarkation or at the guest services desk) and just explore the interiors of the ship. The Carnival Liberty cruises the sunny Caribbean year-round, so its outdoor areas can get very busy when the weather is good. The ship has two large swimming pools on the Lido Deck--one midship pool and the other Versailles Pool next to the pizza bar aft of Emile's Bistro buffet. The Carnival Liberty also has a large water slide, kiddie pool, and several hot tubs. The busiest bars on our western Caribbean cruise were the BlueIguana Tequila Bar and the RedFrog Rum Bar. These two outdoor drinking venues flank either side of the Lido deck pool and were added during the 2011 renovation. What a great idea to have two such fun places outdoors, and the friendly competition between the "blue" iguana and "red" frog carryover to several activities during the cruise. Those looking for a drink certainly don't have to go far. The large outdoor Seaside theater screen is also next to the Lido deck pool. Serenity is the adults-only area forward on deck 12. There is no extra charge to use this facility, and it has padded lounge chairs, double clamshell lounges, hammocks, and two large hot tubs. It's a great place to escape the hubbub on the Lido deck. Guests who get tired of lounging around, drinking, or enjoying the pool and hot tubs might want to escape to the sports deck aft on deck 11. There, they can jog, play miniature golf, basketball, or volleyball. The Carnival Liberty has all sorts of non-stop activities on our western Caribbean cruise, most of which you would expect on a large mega-ship. The swimming pool and deck areas were terrific, and the Carnival Liberty features one of the large, on-deck movie screens over the midship pool. It was much like being at a drive-in theater (without the cars and making out). Videos, in-house talk shows, and news were shown in the daytime, with a movie featured each evening. Those looking for a quiet place on deck sought out the Versailles Pool or the forward adults-only Serenity deck area. The Carnival Liberty gym and spa were forward on deck 11. The spa had all the usual massages and treatments, including a cruise-long "spa seminar" that featured classes on everything from weight loss to detoxification to teeth whitening. The gym had all the latest equipment (including spinning for a fee). Pilates and yoga classes also had a fee, but the rest of the classes and machines were included in the cruise fare. The gym also featured a great view. Days at sea could be filled with bingo, art auctions, funny contests by the pool, dance classes, or gambling in the casino. What we didn't see on the Liberty (and didn't expect) were educational classes or enrichment lecturers. Although the television and daily FunTimes newspaper included information on each port of call, the focus was mostly on Carnival's shore excursions or shopping recommendations. Those preferring to learn about the ports or tour on their own will need to do independent research. The Venetian Palace is the Carnival Liberty's show lounge. The seats are comfortable, with good sight lines, and the room has a beautiful stage curtain and spectacular Murano glass chandelier. The shows by the onboard troupe in the palace are Vegas-style, with lots of singing and dancing. We enjoyed all of them. On the evenings when the show troupe was not performing, the Venetian Palace had a variety of entertainment such as magicians, singers, or comedians. One night we had a "Carnival Legends" show featuring some talented passengers in an "Idol"-style show (but with no one voted off). The Carnival Liberty has plenty of other evening entertainment options in its lounges, and most have live music ranging from classical to jazz to disco to karaoke. The teens even have their own lounge. Just wandering from lounge to lounge in the evening and taking in a few minutes at each was great fun. A large ship like the Carnival Liberty can really stand out in its diversity of entertainment options. I thought that the variety of entertainment on this ship was one of its strongest points, although the casino seemed to be the most popular evening entertainment onboard. The Carnival 2.0 enhancements have added new bars, dining options, and entertainment to the Carnival Liberty. Before the changes, the ship was already an excellent choice for multi-generational groups or couples who want a good mix of both quiet time and party time. These changes have made the ship even better! As is common in the travel industry, the writer was provided with complimentary cruise accommodation for the purpose of review. While it has not influenced this review, About.com believes in full disclosure of all potential conflicts of interest. For more information, see our Ethics Policy.